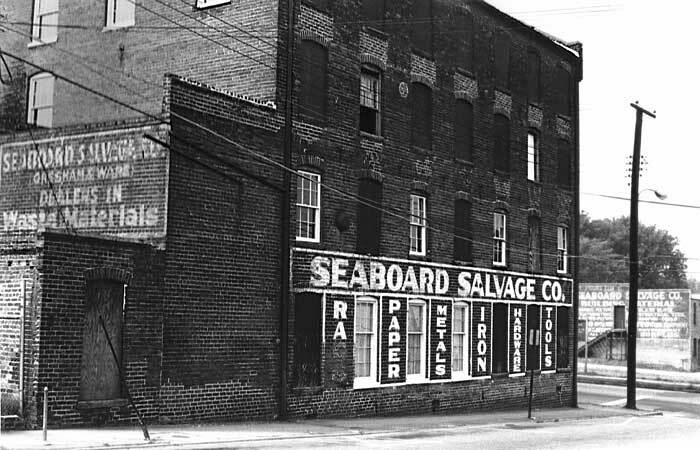 Seaboard Salvage Co. began in the mid-1920s, a scrap metal and junk dealer. They were located at 203 N. Market St. in Petersburg, Va. in Hill's Petersburg City Directory, 1927. It was a division of Gresham and Ware Inc. (Julian R. Gresham and Richard S. Ware). This ad appeared in the Hill directory for 1927. The founders of Gresham and Ware were Julian Robertson Gresham (1888-1968) and Richard Samuel Ware (1888-1965). Julian R. Gresham was born 3 October 1888 and died at the age of 80 1 December 1968 in Petersburg General Hospital. His death certificate listed him as "co-owner Seaboard Salvage Co." He first appears in Petersburg city directories as a foreman at Petersburg Rim and Veneer Co. in 1907-08. In 1909 he married Janie Gertrude Chappell in Petersburg, Va. In 1911-12 he was bookkeeper at R. W. Collier & Co., hauling contractors, located at 3 Franklin St., Petersburg. In 1913-14 he was bookkeeper at Mutual Transfer Co., located at this same address. In 1915-16 he was secretary-treasurer at Mutual Transfer Co. and at Gresham & Co., dealing in agricultural implements. He registered for the World War I draft in 1917, age 28, when he was "Manager, Mutual Transfer Co. Inc., 203 North Market Street." In 1920 he appeared in the Petersburg city directory as president of Gresham & Ware, Inc., "hauling and Storage," 203 N. Market St., and secretary-treasurer at Gresham & Co., farm implements. Julian R. Gresham's father was Samuel Robert Gresham (1860-1932). He appears as president of his own company Gresham & Co. from 1913-14 through 1924, then emerges as a superintendent at Seaboard Salvage Co. in 1929 and 1931. His death certificate (5 April 1932) gives his occupation as Manager, Seaboard Salvage Co., and says he last worked March 1932 and that he spent six years in this occupation. Early in his career Samuel R. Gresham was a bookkeeper for W. M. Lewis & Bro. (carriage manufacturers and dealers in farm implements) and for the Mutual Transfer Co. (movers: "boilers, machinery and furniture, moving our specialty"). In 1913 he helped found Gresham & Co. which initially dealt in carriages and wagons, then in agricultural implements. According to his death certificate Richard S. Ware died 6 October 1965 of a gunshot wound to the head ("Shot himself in the head"). He was born 28 December 1888 in Louisa County, Virginia. He registered for the World War I draft in 1917 when employed as a construction foreman, age 28, in Richmond, Va. In 1920 he appeared in the Petersburg city directory as secretary-treasurer of Gresham & Ware, Inc., "Hauling and Storage," 203 N. Market St., Petersburg. Julian R. Gresham's son, Julian Robertson Gresham Jr. (1919-2016), was also a member of Seaboard Salvage. The following notice can be read online at http://obittree.com/, "Julian Robertson Gresham Jr., 96, of Colonial Heights, passed away Tuesday, May 31, 2016. He was born July 25, 1919 to the late Julian R. Gresham Sr., and Janie Chappell Gresham; and was preceded in death by his wife, Louise Fuller Gresham. Mr. Gresham was a WWII, United States Navy veteran, and the co-owner of Seaboard Salvage. He has been a member of Colonial Heights Baptist Church since 1951, a lifetime member of the Fellowship of Christian Magicians and was also a member of the OCF Bible Study. Mr. Gresham is survived by his daughter, Sylvia Link and husband Charles of Beaverdam; two granddaughters, Whitney Meredith Link and fiancé, Mathew John Pitschke and Courtney Blair Link." In some ways Gresham & Ware was an outgrowth of R. W. Collier & Co., who appear as early as 1872 in the Chataigne & Boyd Petersburg City Directory where they are described as "contractors for hauling." R. W. Collier was Robert Williamson Collier (1845-1904). R. W. Collier combined with his brother, Sterling Kennon Collier (1849-1939), to form their hauling and draying business, probably shortly after the Civil War. His father was Robert Ruffin Collier (1805-1870), a lawyer whose office on High street was announced in the Petersburg Daily Index 21 April 1866. Robert R. Collier's "Remarks on the Subject of the Ownership of Slaves" delivered in the Virginia State Senate 12 October 1863, can be read online at http://docsouth.unc.edu/. The following appeared in the Richmond Times-Dispatch 26 April 1904, "PETERSBURG. VA., April 25.-Mr. Robert W. Collier, one of the most prominent business men of Petersburg, died last night in North Carolina where he had gone in the hope of benefiting his health. Mr. Collier had been suffering from nervous indigestion for several years, and during the past few weeks was almost a total wreck. Saturday a letter was received from him, saying he was improving, and the first intimation of a change came in a telegram yesterday afternoon, stating that he was ill. Early in the evening another followed, saying he was sinking and the end was near. The alarming news came as a great shock to the devoted family and friends, and Mr. Fisher Collier started at once for his father's bedside, but death occurred many hours before his arrival. While some apprehension was felt by his family, when Mr. Collier left, no one dreamed that the end was so near. Mr. Collier had been in business in Petersburg since early manhood, and throughout his long career, held the respect and esteem of the entire community. He was a member of the Common Council, and connected with various enterprises for the good of Petersburg. He was a consistent Christian gentleman and for many years had been a deacon in the First Baptist Church of Petersburg, He was a son of the late R. R. Collier, one of the most eloquent and influential lawyers in his time. Mr. Collier is survived by a widow and eight children, Misses Alice, Martha, Margaret and Estelle Collier, Mrs. Samuel Wilson, and Messrs. Fisher, Charles and Wallace Collier. Dr. Christopher Winfrey Reed. (Special to The Times-Dispatch.)" Sons of Robert W. Collier who were involved with R. W. Collier & Co. included Charles Fisher Collier (1875-1922) and Charles Fenton Collier (1883-1915). C. Fisher Collier was a manager at R. W. Collier in 1901 when the business was located at 200 South Sycamore St. In 1905 Charles F. Collier was a clerk at R. W. Collier, who by this time were carriage and wagon manufacturers as well as contractors for hauling. Other business enterprises of C. Fisher Collier were the Appomattox Trunk & Bag Co., the Appomattox Box Shook Co., and the Upper Appomattox Company, an ambitious project to provide for shipping above the fall line on the Appomattox River. Incorporated in 1795, this company built "the 5 1/2 mile Upper Appomattox Canal from the head of the falls to a basin in Petersburg, and constructed numerous wing-dams from Farmville down to the canal, a distance of 100 miles" (http://www.americancanals.org/). Apparently this generation of Colliers shared misfortune with their successor, Richard S. Ware. Charles Fenton Collier's death certificate in 1915 said that he shot himself in the head. C. Fisher Collier is possibly the C. F. Collier who died 24 March 1922 in Eastern State Hospital, Williamsburg, Va. His cause of death is recorded as Myocarditis (chronic) / contributory "Manic Depressive Insanity." Early on, Samuel R. Gresham worked for the firm of W. M. Lewis & Bro. These gentlemen were William Mason Lewis (1858-1930) and Andrew Lafayette Lewis (1865-1943). They were carriage manufacturers listed in the Chataigne Petersburg Directory 1886-87 located at 218 Halifax St. By 1903-04 they were dealing in farm implements, harness, and hardware in addition of carriage manufacture. This ad for W. M. Lewis & Bro. appeared in the Hill Petersburg City Directory for 1903-04. Gresham & Ware seems to have come directly out of the moving and storage business of Mutual Transfer Co. The earliest listing for Gresham & Ware in Hill's 1920 Petersburg directory described them as "hauling and storage, moving boilers, machinery and furniture a specialty." Identical wording was applied to Mutual Transfer in the years 1915 to 1917. Julian R. Gresham and Charles Fenton Collier were both employed at Mutual Transfer during this company's short lifetime from 1913 to 1917. In 1921 Julian R. Gresham and Richard S. Ware were officers in the G. T. Willis Coal Co. G. T. Willis was Gerald Tennyson Willis (1894-1962). By 1929 only Gresham and Ware were listed as owners at this company, now called the Willis Coal Co., while Gerald T. Willis was now listed as a salesman at Gresham & Ware and at Seaboard Salvage Co. In 1942 Gerald T. Willis registered for the World War II draft, age 48, born 9 January 1894, Elizabethton, North Carolina. He lived at this time at 1111 Halifax St., Petersburg, and said that he was employed at Willis Coal Co., 28 North Market St., Petersburg. In the early 1940s Willis Coal Co. merged with the J. D. Smith Coal Co. to form J. D. Smith-Willis Coal Co. located on Lee Avenue at the end of South Dunlop St., Petersburg. J. D. Smith was John Davis Smith (1868-1950), who in the 1910s was bookkeeper and manager at the Cockade City Coal & Coke Co. He appears as J. D. Smith "coal and wood" at 914 Union Ave., in the 1920 Petersburg city directory. This ad for J. D. Smith is dated 1924. After the merger with Willis Coal Co., Gresham and Ware were no longer involved with the company. Owners were John D. Smith, and his son, John Charles Smith (1902-1976). This ad for J. D. Smith-Willis Coal Co. appeared in the Petersburg City Directory for 1943. This building has signs on both the Tabb St. and Market St. sides, as well as across the street on Market St. (visible dimly on the right in this image).